"I love dressing up and taking my grandsons trick or treating." Tammy, shoot me an email as soon as possible with your mailing address at mary@deepsouthdish.com and I'll get this handbook out to you right away. Congratulations!! Wow y'all, can you believe October is winding down already? Course, it takes awhile for those temperatures to start dropping down here in my part of the Deep South, but we're even seeing some chill down here this week finally, and the end of October means Halloween fun! I always love seeing how excited the kids get about what they're gonna be and all the cute and creepy things that my blogging friends come up with for their parties. All You magazine is one of my top favorite lifestyle women's magazines and I love their speciality magazines on shopping, money saving and, of course, cooking and holidays. Their first ever, Frightfully Fun Halloween Book is no exception, filled with loads of recipe ideas, crafts and costumes - and it's available at many retailers, bookstores and even online at Amazon, where you can order it right now and have it in 2 days with your prime membership, so there's plenty of time for Halloween party planning inspiration! Consider it your ultimate guide to to celebrating Halloween affordably. In it, you’ll find instructions for everything you need in order to pull off the best Halloween party on your block. This guide packs in 200 pages of budget-savvy ideas, over 75 ghoulishly good recipes, over 70 creepy crafts and decorations and 30 costumes for adults and kids alike. Written by the editors of All You magazine, every idea includes easy-to-follow instructions, a list of ingredients or supplies needed and includes dozens of templates to help give projects a professional look. There's even craft templates in the back of the book so you can make the perfect haunted house in a snap. No matter whether you're gathering toddlers, teens or adults for your annual spookfest, the All You Frightfully Fun Halloween Handbook offers low-cost, big-bang ideas to ensure everyone a hauntingly good time. Readers will find everything they need for an outrageously fun Halloween, including soup-to-nuts theme parties for all ages. Get in the spirit by making pumpkin decorations for the front porch or dining room table from adorable pumpkin families to classic jack-o-lanterns to down-right scary skulls. 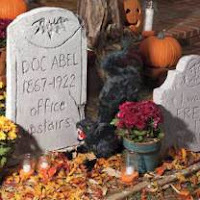 Send chills up the spine of trick-or-treaters and passerby with spooky decorations for the front door, porch and yard. Ideas include covering the doorbell with a black-caped witch, sitting a life-sized pumpkin man on the porch, and hanging flying ghosts from trees. 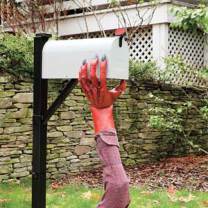 To make your stoop the scariest of them all you won’t want to miss out on the Terrifying Tombstones craft. To help set the mood in the house, All You shares loads of ideas and inspiration to transform rooms. For an eerie glow, create miniature haunted dollhouses, googly-eyed spiders or ghostly window treatments. To celebrate in a more subdued elegant fashion, display framed leaves, faux pumpkins or harvest vases made from winter squash. Throw a party with suitably festive food and decorations. All You provides dozens of recipes for appetizers, main dishes, sides and desserts, and suggests setting the table with bat mobiles, ghost lights and other spooky ideas. Delight Halloween revelers with creepy-crawler cupcakes, spider web cakes and dozens of other spirited desserts. 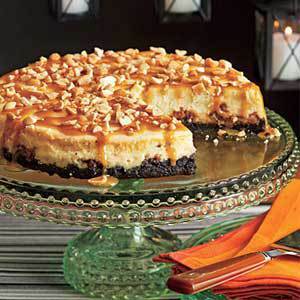 And they didn’t forget to include their yummiest Halloween dessert recipes! 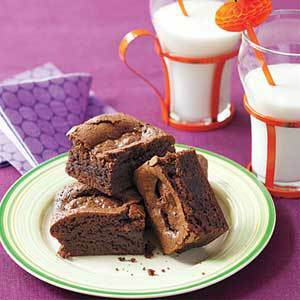 ... or how about some Almond Joy Brownies? 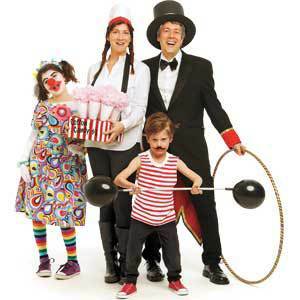 Be it a princess, a robot, or a bunch of grapes, All You offers costume ideas for the whole family to help bring dreams to life, like this Family Circus. It's the perfect resource for Halloween and you'll hold onto it for inspiration for years to come. Purchase your copy of the Frightfully Fun Halloween Handbook on Amazon.com or a local retailer or bookstore near you today! GIVEAWAY IS CLOSED! Please check back shortly for the winner's name to let me know where to mail your book!! The publisher has offered me ONE free copy to give to ONE lucky Deep South Dish reader free - yay! TO ENTER: Simply comment below to enter for a chance to win and tell me what you love about Halloween! That's it! You may post with the NAME/URL or ANONYMOUS options, but be sure to fill in your name or leave your name along with your comment so I'll know who you are if your name comes up in the random draw. HURRY!! This giveaway closes at NOON CST Thursday, October 24, 2013. One winner will be selected at random from the comments and will be announced on Thursday evening at the site on this same post. Readers are responsible for checking back to see if they were selected and need to provide name a complete mailing address to me via email at mary@deepsouthdish.com as soon as possible, so that I can get this out to you in time for Halloween party planning! Giveaway open to U.S. residents only please. This giveaway is a quick turnaround and only open for ONE DAY, so I can get the copy out to the winner so STOP BACK by no later than Friday morning to learn if you've won and shoot me your address real quick like, so I can rush this out to you. Disclosure: I received one free review copy plus another copy of All You Frightfully Fun Halloween Book to host this giveaway. 67 HUNGRY PEOPLE COMMENTED. ADD YOURS! I love the excitement of my kids as they get to dress up and go door-to-door for candy! Such an exciting night! I am a rather new follower - but I love your food - of course I am from the south. I love Halloween - the colors - the time - of year - the fun. I have my grandson living with me so it makes Halloween even more fun! I lovr halloween as it is the season of changes. the leaves change the weather gets colder and the smells of fall are wonderfully cool and crisp. The time of year were magic begins. I love seeing how excited the little ones are about picking out costumes & trick-or-treating! Makes me want to be a kid again! I also love "sampling" all the candy I buy to hand out!! I HAVE to make sure it's FRESH!! Hahaha! Looking forward to seeing all the kids dressed up and having fun at Halloween! Halloween is such a fun time of the year. I love decorating and making fun and spooky Halloween desserts. Halloween is such a fun time of the year! I enjoy decorating my house and how the kids in the neighborhood love coming around to look at them during the day, so they are not too frightened during the night! I am having my second annual party this year and since I have Rheumatoid Diseases and my 11 yesar old son does, it is always a dart board gamble if we can pull it off without painful issues. THANKFULLY, we have friends and family that chip in and help! To all of you who help other people, your compassion is worth more than gold! Love Halloween with the grandkids...always looking for new treats and ideals. I love the Halloween treats and seeing my children have so much fun. Thanks for this fun giveaway. I love the pumpkins and little ones all dressed up - especially my grandkids. I love everything about Halloween!! Crafts with my kids, finding or making our costumes, and of course the candy. I love how excited the little kids are in their costumes. Halloween is my favorite day of the year, love it all! I have loved Halloween since my kids were little, taking them trick or treating. Now my grandkids go and I stay home and give out treats. I have so much fun seeing all the great costumes. Crafts and baking are always done during the season. This looks like such a fun giveaway. What I like most about Halloween is the trick or treating. Yea the candy is fun, but that's not it. The costumes are fun, but that's not it, the children are simply adorable but that's not it. It's community. Yea that's it. It's one night neighbors get out, talk to one another and there is a sense of unity. I love that about Halloween. Love you blog! Would love to win the All You Halloween book! BOO ! THANK YOU ! It's the start of the holidays for me...a holiday a month for the next four months. I love listening to the g-kids planning their costumes, but most important, it's the time together! I love all the children getting to be a child on that one night and enjoying all the candy they can eat and of course all the neat desserts that we adults make. Thanks for the chance that would be a wonderful book to have. Love it! Always looking for great party, food, decorating, and costume ideas! Love to see all the little kids all dressed up. 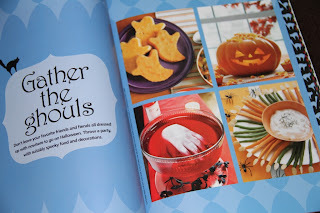 Wow would love this book.....I love decorating the house inside and out for Halloween. And giving out the candy and all the kids trick or treating.....ciao4now64 at yahoo do t com. Decorating for Halloween is the best. So much fun. I love seeing all the kids in their costumes. I love the fun of Halloween - dressing up - kids trick or treating for goodies - decorating - parties & most of all, the chocolate! I love everything Halloween! Its my favorite holiday! I love to see the kids dressed up and I always dress up to walk around with my kids and this year my grandkids!! I love dressing up and taking my grandsons trick or treating. Halloween is much more than just one day. It's taking walks in piles of leaves, picking apples, hay rides and of course going to the pumpkin patch. We love to decorate the house and carve pumpkins. We love to go trick or treating. There are so many things to do this time of year. I am not sure there is a down side to this time of year. Not to mention I get to make yummy stews and soups that are just plain to warm eat during the summer. Halloween was always my kids' favorite holiday. I look forward to continuing this tradition with our grandchildren and creating memories with them. 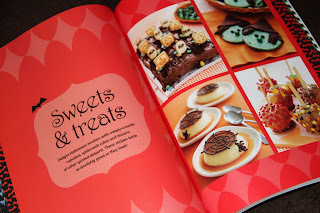 Love to decorate, make treats and can't think of a better collector's book to have! This book sounds wonderful, would love to have it!! I love seeing the kids trick or treating. I love coming up with scary, ghoulish items to cook for our Halloween dinner. I't so fun to see the children getting excited about their costumes and activities. Halloween is one of my fave times of year! 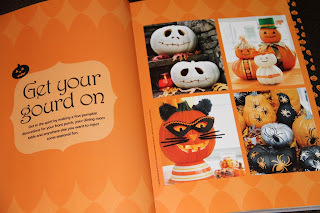 This book looks so cool...we go all out for halloween & this could help with fresh,new ideas. I love Halloween, the food, and fun making gets me in the mood for Fall and the Winter holidays! I've enjoyed Halloween as a child, a mother & now, a grandmother! 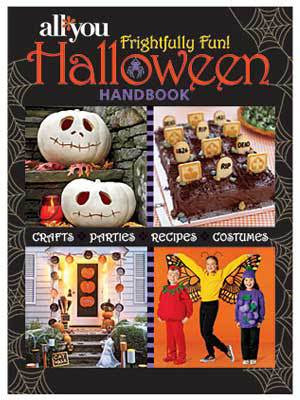 It would be fun to read the Halloween Handbook with my grandchildren & pick out fun things to do together. Love haloween costumes and the kids in them especially around infant to about six year olds. This book would be awesome to have!! Love, love, love Halloween. From the decorations, to food, candy, and just the fun spirit of the holiday. I love holiday cookbooks! ! Love to win!!! I would love to own this book to add to my collection. Thx for the chance to enter. My two favorite times of year are Fall and Spring - But the Fall seems to wake people up with the brisk, cool days and evenings. The leaves fall like dancing fairies and everyone starts to think about Halloween, Pumpkins and Turkeys! Halloween is so much fun decorating and fixing good things for all the Trick or Treaters! When my kids were young, we always had a Halloween Carnival at our house and every bedroom was turned into a different theme, from go fish, cake walk to haunted house. Now I have grand kids and I still decorate inside and out and love, love to fix Halloween treats! Next we will work on Thanksgiving and to have a wonderful cookbook/idea book like yours would be great with so many wonderful ideas! Thanks for giving me the opportunity to enter! Now that my grandson is almost 4, he's really into it this year so it brings a bit more excitement than most years for me. Love decorating for Halloween and all the other joys this time of year brings!! Oh I love Halloween as it's such a fun time of the year. The air is crisp and the leaves are changing color and falling. Halloween means decorating, good food and spending time with friends. I love everything about Halloween...especially the candy!!! Hopefully, cooler weather and of course the candy! Halloween has always been my favorite holiday....the costumes, the candy, and my birthday is the next day! Halloween is one of my favorite holidays. When I was a little girl, my mother always made my costume and I went trick or treating with a group of children from our block. It was so much fun to receive home made treats. They were the best! Love seeing the kids in their costumes and handing out candy! I have wonderful Halloween memories from my childhood. But the best thing I love about Halloween is, it's my granddaughter's birthday! Best holiday ever!!! I absolutely love the costumes!! Giveaway is CLOSED! Thanks so much for entering & be sure to check back shortly to see if you won. Contact me by email and give me your full name and mailing address so I can get this out to you ASAP! Good Luck! !